As ice was laid down in successive layers from previous years, it acted like tree rings, recording weather patterns and circulation as Earth cycled through colder and warmer periods. In a new study, scientists found that volcanic dust embedded inside the ice samples suggests that the West Antarctic Ice Sheet collapsed during the last warm period 130,000 years ago—which researchers are eager to know because a similar collapse today would have major implications for the world's population. "There is some evidence from coral reefs that suggests the oceans were 16 to 30 feet higher during the last interglacial period then than they are today, so people really want to know where that extra water came from," said Sarah Aarons, a University of Chicago postdoctoral researcher who led the study, which was published online Feb. 12 in Geophysical Research Letters. The West Antarctic Ice Sheet is believed to be especially susceptible to climate change because "it's grounded below sea level and tilted, which would make it very easy to destabilize," Aarons said. However, studies have not been able to determine whether it eroded gradually or collapsed more suddenly during the last warm period, because of the lack of available records that far back in time. The consequences for human civilization are significant for each scenario: Scientists estimate a sudden collapse would raise sea levels by about 10 feet—with devastating consequences for millions of people worldwide. So Aarons and other climate scientists trekked to the toe of the 34-mile-long Taylor Glacier, which sits near the intersection of the West and East Antarctic ice sheets and the ocean. They drilled down into the ice and extracted samples from the layers that correspond to the transition from a cold glacial period to the last warm interglacial period. 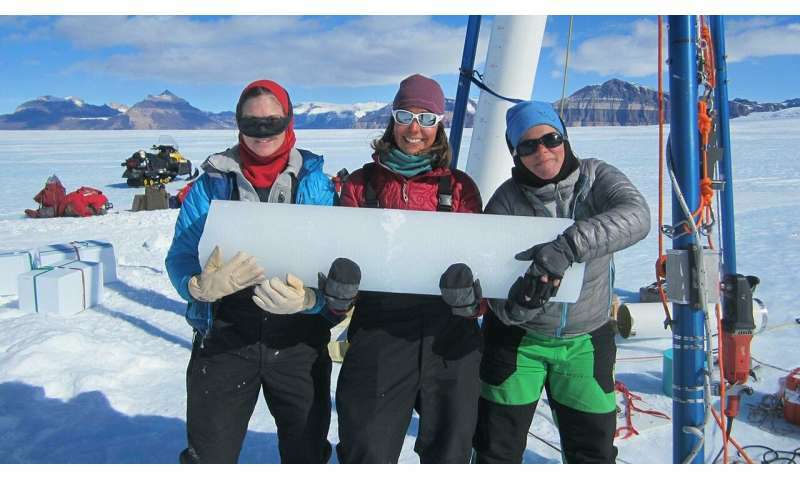 Embedded in these ice cores, each about 9 inches in diameter and 3 feet long, are particles of dust picked up and carried by prevailing winds—a record of Earth's surface conditions, weather patterns and circulation at the time. "The dust composition we see really requires a profound difference in atmospheric transport, and likely ice sheet size, from the last interglacial period to the one we are currently in," Aarons said. Several scenarios could account for the dust. A collapse of the West Antarctic Ice Sheet would disrupt wind circulation and weaken the polar jet—carrying dust from new locations. 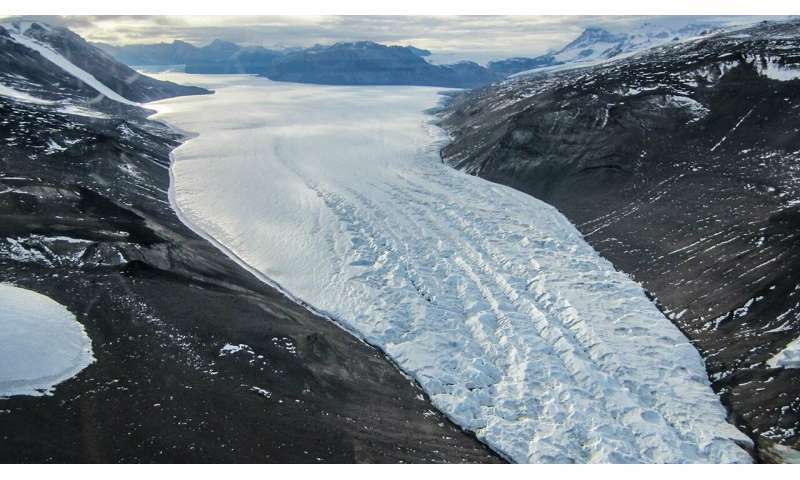 As the ice sheet retreated from land, it would expose fine-grained volcanic rock. Finally, in a less likely scenario, it's possible the ice sheet collapse actually triggered more volcanic activity by suddenly removing weight from the Earth's crust. "All three scenarios require a significant reduction of the West Antarctic Ice Sheet, however, and suggest that the continued focus on this ice sheet as a source of sea level rise is warranted," Aarons said. The last interglacial period is not a perfect analog for today's times, Aarons explained, because a few things were significantly different back then—such as the tilt of Earth's axis, which affects how much sunlight and warmth the planet receives. But the better our picture of how Earth's climate reacts to changes, the better we can predict the future. She wants to return to Antarctica for more ice samples from other glaciers that reach even further back in time. "Actually, some of the previous interglacial periods are even closer to today's conditions than this one," she said.